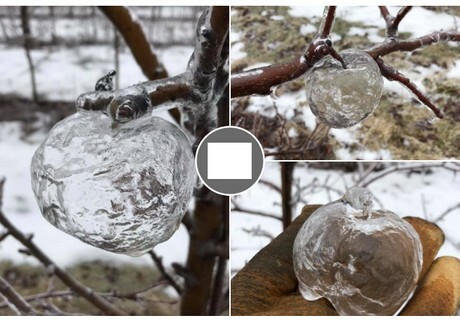 Sparta, Kent County, resident Andrew Sietsema took these photos, depicting ice casings left behind from apples in West Michigan’s fruit producing country. He found them while pruning apple trees. The “ghost apples” likely formed when the freezing rain coated the rotting apples, creating an icy shell around the fruit. When the rotten apples fell to the ground, they left the ice formations behind.